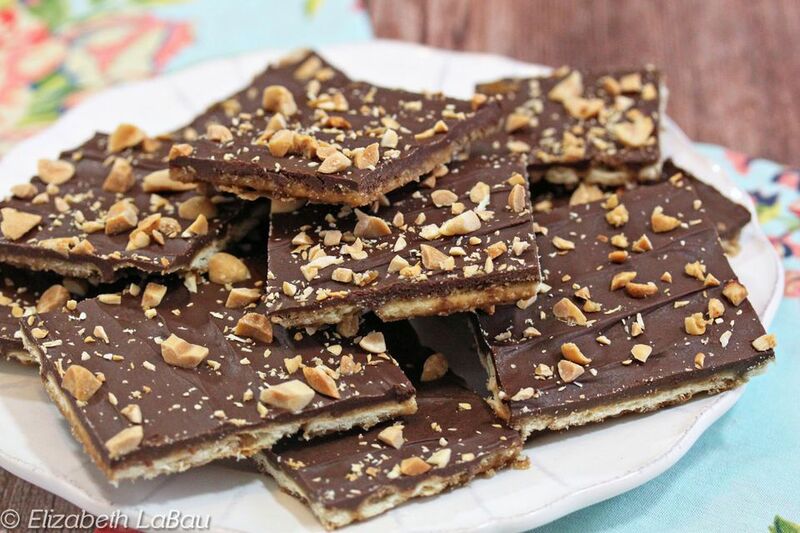 With just five common ingredients, you can make delicious saltine toffee at home. The recipe is so easy and creates a crispy, crunchy toffee that you have to taste to believe. The secret to this simple candy recipe is that it uses saltine crackers as the base. When topped with buttery brown sugar, melted chocolate, and chopped peanuts, it becomes a sweet and salty treat that everyone will love. To make the recipe even more appealing, the toffee will be ready in little more than an hour! It's a perfect last-minute sweet that you can whip together for any party, occasion, or to simply enjoy on your own. Preheat the oven to 350 F. Prepare an 11- by 17-inch baking sheet by lining it with aluminum foil and spraying the foil with nonstick cooking spray. Arrange the crackers in a single layer on the baking sheet so that there are no empty spaces between them. Break a few crackers into pieces if needed to fill all the gaps. Bake the toffee crackers for 5 minutes, until the toffee is bubbling all over. Carefully remove the pan from the oven and allow to cool for one minute. Sprinkle the chocolate chips on top of the hot toffee, and allow them to sit for one minute to soften and melt. Once softened, use an offset spatula or knife to spread the melted chocolate over the entire surface of the toffee in an even layer. While the chocolate is still wet, sprinkle the top with the chopped peanuts. Refrigerate the pan to set the toffee and chocolate for about 30 minutes. Once set, cut into small pieces. Store the saltine toffee in an airtight container. It will keep for up to a week. If you're concerned about nut allergies, skip the peanuts. Though salt adds to the flavor of the toffee, you can replace the saltines with salt-free crackers and use unsalted peanuts. Or, reduce the saltiness by brushing some of the salt off saltines. Feel free to add other nuts or dried fruit to the top of the melted chocolate. Give the toffee a little extra decoration by adding swirls of white or milk chocolate. It's an easy way to dress up the candy for a special occasion. More toffee recipes to try.